Virtual Reality immerses you in a different world, Augmented Reality changes and alters the world you are in. That is the easiest way I can describe the difference between these two technologies. Where things get even more interesting is when you bring Mixed Reality into the conversation. Imagine a slider of immersion. On the far left you have the complete immersion of virtual reality and on the far right you have augmented reality overlaid on the real world. In this article, I will attempt to highlight some of the ways these technologies will impact retail and how marketers can use VR/AR to connect with consumers and ultimately sell more products. I have coined the term vCommerce in this article to be an all-encompassing term that describes Virtual and Augmented Reality Commerce. The reason I started this article with the above explanation is because I get this question nearly every time I speak with someone about the subject. Hopefully this clears things up a bit so we can move on with the discussion of how virtual and augmented reality are going to change retail, eCommerce and now vCommerce. Let’s start by discussing how virtual and augmented reality is going to impact retail. I say ‘going to’ because the truth is, there are many people working in this, but so far no one has really completed something useful…yet! I have tried countless vCommerce demos from all over the world and they are all wonderful and engaging and all of them totally miss the point that with VR, you do not need to be in a store anymore. There are so many possibilities and all anyone can do is put a physical store into virtual reality?? Where is the creativity with this? Why shop in a store when you can shop in Italy? What if we created an experience while shopping so when you pick up certain products, the whole world you are in vanishes and morphs into a whole new world. Imagine grabbing a box of pasta off the shelf and suddenly you are in Italy learning about the company and how they make their pasta so delicious? What if you were at a virtual car dealer and simply by touching the car, you are now in the driver’s seat on a drive through the hollywood hills! There is literally no limits on what is possible. Personally, I feel like VR and AR will revolutionize online and brick and mortar stores in the coming years by thinking outside the box (store) and really driving engagement with products that gives customers a sense of presence and agency (meaning they take ownership of their virtual body). Once you have customer engagement with a brand, you can let them lead the experience and that results in a much deeper, more personal relationship between the brand and consumer. Emotion is one of the primary reasons why consumers prefer (and pay more for) brand name products. “fMRI neuro-imagery shows that consumers primarily use emotions (personal feelings and experiences) rather than information (brand attributes, features and facts).”1 Instead of seeing a brand or reading about a brand, Virtual Reality allows consumers to ‘experience’ the brand. Think about it this way. If you are in a store and trying on hiking shoes and in that store are a bunch of shoes by brands you recognize, but one stands out because you have climbed Mount Kilimanjaro while wearing that brand (in virtual reality). Chances are you will trust the brand that gave you such a thrill over a brand just sitting on a shelf. What if every product you picked up in VR had its own experience? What if everything you picked up took you on a magical journey? Marketers now have a new tool in their arsenal to not only attract buyers, but to really connect consumers to their brands in a novel, exciting and stimulating way using VR and AR. The Gap recently announced at CES that they are working on a new augmented reality application that will allow consumers to see what their clothes will look like in any size right in front of them. Working with Google’s Tango AR phone, they are able to use spatial recognition to make things appear as if they are actually in the same room. I would expect to see more of this with furniture stores as well. What about Retail Analytics using VR? Another major use case for virtual reality is to visualize and test new stores, packaging, signage and even lighting before a store is even built. It costs millions of dollars to build out a store and hundreds of thousands running testers through that store to gather valuable data on shopper habits and actions. What if you could create the store environment in VR and have unlimited shoppers go through from the comfort of their home or regional testing centres that cost a fraction of a build out? 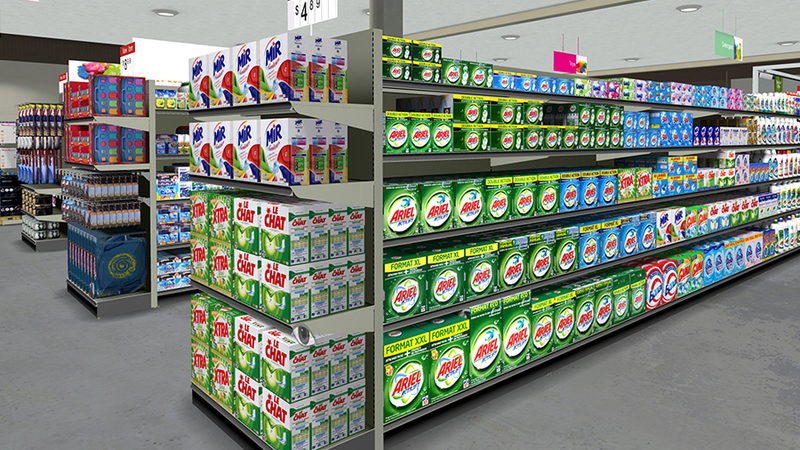 What if you could combine virtual shopping with super accurate eye tracking to know exactly what catches your customers eye, for how long and really understand shelf placement from a shoppers perspective. How valuable would this data be to you as a marketer, store designer, packaging designer? The possibilities for virtual and augmented reality are real and they are here now. Here are some more exciting examples of how VR/AR are being used by forward thinking, technology driven brands focused on the future of retail. Ikea is experimenting with VR by letting people design and interact with their kitchens. You can even cook their famous Swedish Meatballs in VR!! As you can see the future of retail is going online and virtual and augmented reality are going to play an ever increasing role in driving global sales. In my opinion, vCommerce is the next big thing and if you don’t believe me, Citi’s GPS report on VR estimates the market for VR/AR retail could go as high as $1 Trillion by 2025.